Last week many traders were dumbfounded when, just as speculation was building that China was preparing to unleash a massive credit expansion a la Shanghai Accord, Beijing confirmed that it had indeed decided to massively reflate its (and the global) economy, in what may soon be dubbed the Shanghai Accord 2.0, when the PBOC announced it had flooded the economy with a gargantuan 4.64 trillion yuan in various new forms of debt which comprise China's Total Social Financing in January, including notably, the "shadow" credit which Beijing had been aggressively cracking down on: an aggressive credit expansion which many took as a tacit confirmation that China was losing the fight with deleveraging. 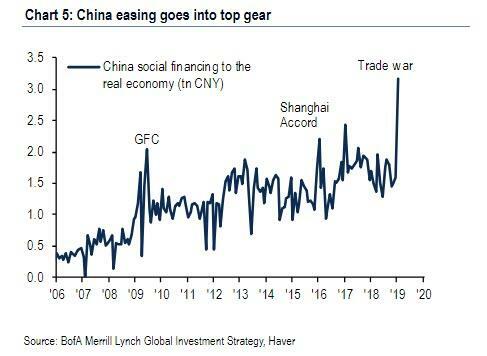 As the following chart from BofA's Michael Hartnett shows, which puts China's latest credit expansion in historical context, January's debt tsunami was vastly greater than China's credit expansion during both the global financial crisis and the Shanghai Accord. And while analysts, economists and markets cheered this unprecedented credit generosity by Beijing, which appeared to once again throw in the towel on deleveraging after a similar attempt sent overnight rates soaring five years ago and nearly blew up the local banking system, expecting that China will henceforth inject even more debt which in turn will spark an inflationary impulse across the globe and prop up both economies and markets (it's hardly a surprise that Chinese stocks have soared in the past few weeks), it appears that January's gargantuan credit boost may end up being a one off event, because while China's credit injection amounting to over 5% of GDP was welcome by global market, it also resulted in a rare public spat between Chinese premier Li Keqiang and the central bank, after he expressed concern about record credit expansion in January, a result of monetary stimulus intended to support flagging economic growth. As the FT notes, since assuming the premiership in 2013 alongside President Xi Jinping, Li has been "a consistent critic of the large-scale stimulus that their predecessors launched in response to the 2008 financial crisis, which economists said led to wasteful investment and a dangerous increase in debt." The spat, according to analysts, is the result of Li’s concerns that his credibility will suffer if the government was seen as backsliding on its commitment to avoid heavy-handed stimulus. And there is no better way to feed such speculation than by injecting nearly $700 billion in credit in one month, more than the GDP of Saudi Arabia. 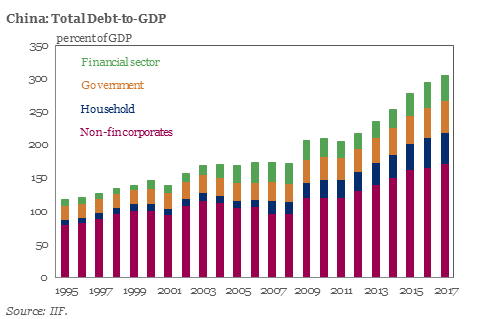 ... absent massive new credit creation, the economy tends to grind to a halt. There was just one problem: these stimuli were too feeble to move the needle on the local economy, which until recently was enjoying the tailwinds of trillions in shadow banking, and which has for the past two years been aggressively curtailed. Indeed, as the FT notes, for months, policy loosening failed to boost credit flows, as banks remained cautious on lending into a slowing economy, while the US trade war battered business confidence, reducing companies’ appetite for capital expenditure. "The increase in total social financing appears rather large on the surface, but if one analyses in detail, a large part of this rise was bill financing and short-term lending. Not only does this potentially create ‘arbitrage’ and ‘empty cycling’ of funds, but it may also bring new potential risks." He is referring to what we said last Friday, when we noted that a big part of the TSF surge was the result of a fresh shadow banking expansion. 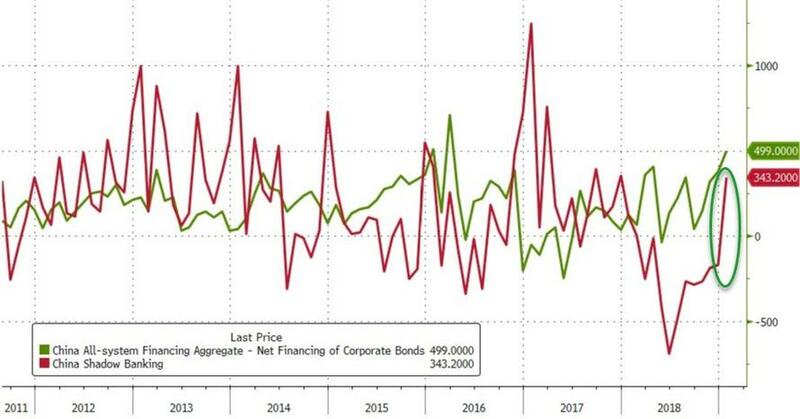 The chart below indicates that Beijing may have thrown in the towel on its crackdown in Shadow Banking, which after contracting for almost all of 2018, not only rose for the first time in 11 months, but soared the most in nearly two years as Chinese regulators now appear focused on providing credit using the very same channels they spent the past two years desperately trying to block. As for Li's references to “arbitrage” and “empty cycling”, these refer to concerns that investors are obtaining low-interest, short-term loans and re-investing the proceeds in high-yielding wealth management products, earning virtually risk-free profits on the spread, according to the FT. The angry prime minister also added that the “fundamental path to solving China’s long-term development problems” was structural reform and a focus on high-quality growth, however as China has observed for the past two years, structural reform takes a very long time, and neither Beijing, nor the world has the patience to wait. But what may be the worst news for an army of analysts and traders who are confident that China has unleashed another credit creation tsunami, is that just hours after Li's statement, the People’s Bank of China appeared to respond directly to Li’s criticism in an interview with an unnamed PBoC official published in Financial News, the central bank’s official newspaper, under the headline “Accurately regarding the January financial data”. As quoted by the FT, the official argued that China was not embarking on “flood irrigation-style” stimulus, saying that January is traditionally the biggest month of the year for bank loans due to seasonal factors. The official added that small businesses were the main beneficiaries of bill financing and other short-term loans. While acknowledging the possibility for arbitrage, he said such transactions were only “minority behaviour”. The question now is whether after January's massive credit injection, the PBOC will take heed from Li's warning and ease back on the gas, or do what it has always done before on the verge of a recession, and despite its soothing words to the contrary, unleash a flood of credit which while kicking the can for another quarter or two, will only result in even greater pain when China's credit house of cards finally comes crashing down. 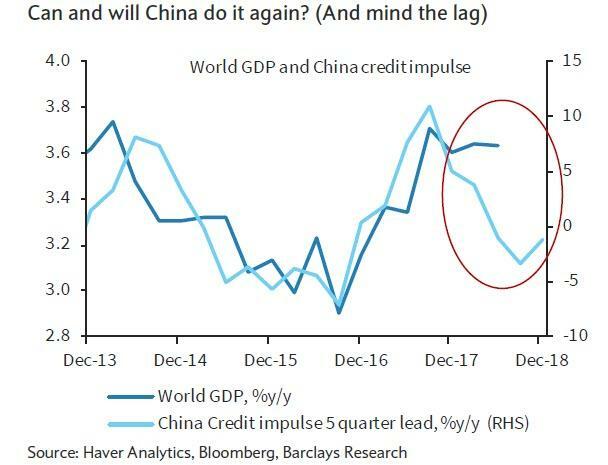 There's one more thing: while China's reckless credit flood will only result in even more tears in the end, for now it may well be the only thing that keep the global economy from foundering because as we showed last week, the only chart that truly matters for the global economy is the size of China's credit impulse, and whether Beijing can do it again. As shown below, already the world economy is set for a steep drop just to catch down to where China's credit creation has been recently. Which means that while listening to Li would be the most prudent thing for China's economy in the long run, it also means that if Beijing reverses on its massive January credit expansion in February and onward, another global recession would seem virtually inevitable.